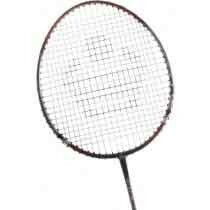 The CBX-555 T from Cosco is best suited for beginner level games of badminton. The racquet has a balance of 31-32.5 cm. The head size of this badminton racquet is 56 square inches. The pre-strung racquet features a jointless body with a wide frame. The racquet comes with a full cover that protects it from any wear and tear that is likely to happen off court.